Wedding chairs at your wedding will do much more than merely provide a place for your guests to sit down. The right seating can add a lot of style and even color to your wedding decor. From slipcovers to lounge seating, modern to formal, this is everything you need to know to plan elegant wedding seating. 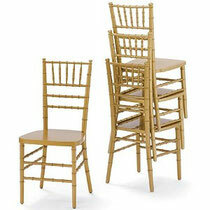 The classic wedding reception chair is the gold chiavari chair. The graceful lines and gold paint of the chairs are ideal for traditional weddings where the bride wears a classic gown with pearl bridal jewelry. They are frequently used in ballroom wedding receptions. Gold is not the only option for this delicate style of chair. For an outdoor wedding, white chiavari chairs are graceful without appearing overly formal. If you want to add a splash of color, order seat cushions to be made that coordinate with your table linens. That is a great detail which will really tie your entire room together. Slipcovered chairs are very popular for weddings, as they lend a room a very feminine and pretty look. White slipcovers are the most common, and are frequently dressed up with a sash in one of the wedding colors. Make the bride and groom's chairs extra special by adding decorative elements to the back of the sash on the slipcover. Hang each of their initials made from flowers or fancy oversized tassels for a formal wedding. Another idea is to make tiny wreaths out of special materials. Flowers are nice, certainly, but you could also do something like faux pearl wreaths to match pearl bridal jewelry, or Christmas ornament wreaths for a holiday wedding. As pretty as slipcovered chairs are, they would seem too busy and fussy at a wedding with a minimalist flair. The perfect seating for a hip, modern wedding? Clear lucite chairs. They are very crisp and clean, and will add an ultra-modern style to your reception. Lucite chairs are great for a wedding in a small space, as they will allow the room to remain visually uncluttered and spacious. No need for covers or decorations when the chairs are so unique. Lounge areas have become increasingly popular at weddings, and they require very special seating. Groups of chairs and low sofas are the usual seats in wedding lounges, and they should be arranged to encourage conversation. Comfort is the key to this seating. Also think about the style you want your lounge area to convey. Many brides like to set the lounge apart with colors and styles which contrast with the rest of the wedding reception. One of the top trends in lounges is a South Beach inspired vibe. Once you see how much the seating choices you make can add to the style of your wedding, it will become clear why it is important to select the right pieces. A great way to make your decision is to have a mock up made of the reception tables with the linens and china and pick the chairs that best coordinate. This way, your guests will not only have a comfortable place to sit, but you will have a reception which is perfect down to the last detail.